The Wine Century Club was developed for all adventurous wine lovers. Have you tasted 100 different grape varietals? I know what you’re thinking: I drink a lot. A lot of wine. Surely I must be a charter member! But It’s not as easy as you might think. 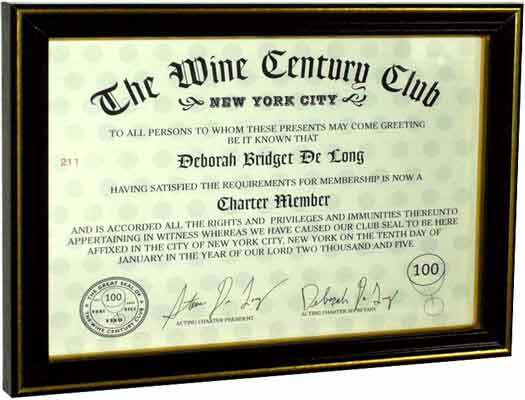 The Wine Century Club is made up of people that enjoy tasting new wines, and have an adventerous streak. Sounds like me! With Family Winemakers coming up, and the Wine Bloggers Conference shortly thereafter, what better way to challenge myself to learn about new varietals. Here is a challenge to all of you Luscious Lushes out there. See if you too can earn one of these fancy certificates! My goal is to have it completed by the time Rhone Rangers rolls around next year. I was just looking at the Century Club the other day. I counted and realized that, without trying, I was up to 54 different grapes. I suspect the other 46 will be a lot harder, but I'm willing to try if you are. Wow! I go to a lot of weird tastings, but am sitll only up to 56 (and that includes evey muscat under the sun and all the almadens of my early youth! )We ahve to have a Weird WIne party!